Let's call it the Bartow Bash and make it an annual affair. 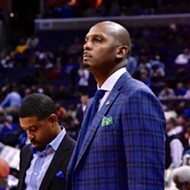 For only the second time since departing Conference USA after the 2012-13 season, Memphis hosted the UAB Blazers Saturday afternoon at FedExForum. 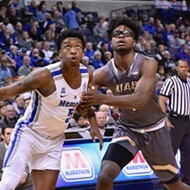 Longtime rivals in both the Great Midwest Conference (Penny Hardaway's playing days) and C-USA, the Tigers and Blazers share the legacy of Gene Bartow, the College Basketball Hall of Famer who coached Memphis State to the 1973 Final Four and founded the UAB program in 1978. 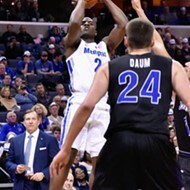 Under a banner honoring Bartow in the FEF rafters, the Tigers pulled away early — hitting seven of nine three-point attempts over the game's first 12 minutes — to earn the win and improve to 5-4 for the season. The loss drops UAB to 6-3 (and 11-38 alltime against Memphis). 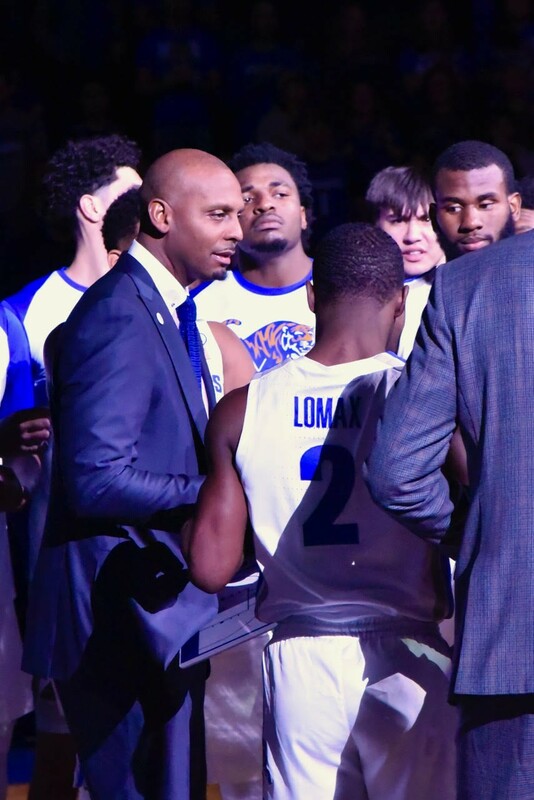 "A total group effort," emphasized Tiger coach Penny Hardaway. "So many contributors today. I'm very excited about the direction we're heading. We've still got work to do, but I'm proud of the effort today." 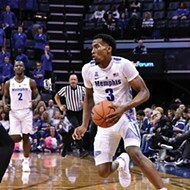 Freshman guard Tyler Harris led the way for the Tigers with 24 points. He hit four three-pointers and connected on 10 of 11 shots from the foul line. 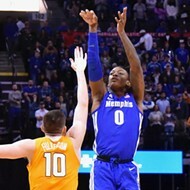 In his fifth straight game off the Memphis bench, Kyvon Davenport scored 21 points in 25 minutes and led the Tigers with eight rebounds. The senior forward seems to like the supporting role. "It doesn't matter if I start or not," said Davenport after the game. "I wasn't doing so well at the start of the season, and I'm getting more rebounds [coming off the bench]. I like it." Davenport drained a key three-pointer after UAB closed a 10-point halftime deficit to four (63-59) with just under 11 minutes left in the game. It was one of three treys (in five attempts) Davenport made in the victory. "Kyvon is really unstoppable," said Hardaway. "I haven't seen any one guy shut Kyvon down. Only he [himself] can shut Kyvon down. Go out there and show these guys they're not on your level. Play freely. When he plays these type of games — scoring almost a point a minute — we're going to be tough to beat." 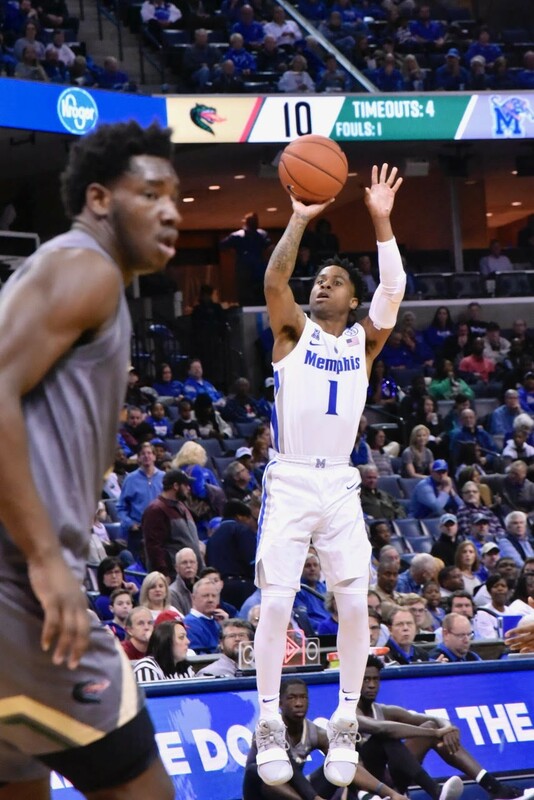 The Tigers had 18 assists in the game and only 11 turnovers, their best such ratio in nine games. They forced 17 Blazer turnovers and closed out defensively at the arc in the second half, holding UAB to one-of-ten from long range after the Blazers hit eight of 12 three-point attempts before halftime. Senior guard Jeremiah Martin scored 14 points and handed out five assists. Isaiah Maurice was an early factor off the bench, scoring six points, but was limited to 12 minutes of playing time by foul trouble. Lewis Sullivan led UAB with 14 points, one of five Blazers to reach double figures in the scoring column. 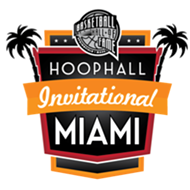 The victory gives Hardaway his first winning streak as a head coach, if but two games. The Tigers will now have a week off before facing one of their toughest tests of the season. "The guys are starting to understand our schemes," said Hardaway. "They're starting to take charges, get 50-50 balls. We didn't box out as well as we should have today, but we're well aware of those mistakes. It's all hands on deck next weekend against Tennessee, because they're a very good team." Currently ranked 7th in the country, the Vols visit FedExForum on December 15th for the first time since the 2011-12 season. 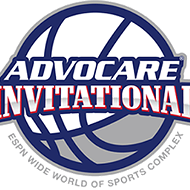 Tip-off is scheduled for 11 a.m. NOTE: Coach Hardaway bobbleheads were given to the first 7,500 fans in attendance at Saturday's game. The rookie coach appreciated the promotion: "I've had bobbleheads before, of course, but never in a suit."